Parents should emphasize to their Scouts the importance of wearing the correct and complete uniform on all suitable occasions. 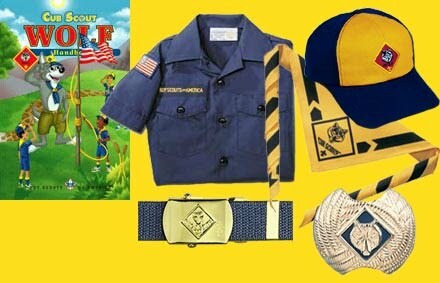 Shirt-- With Pack 3334 Insignia (see below)—The official uniform shirt is available with long or short sleeves and has button-flap pockets and "Boy Scouts of America" lettered in gold above the right pocket. Recommendation: Buy a short sleeve uniform shirt for your boy. A long sleeve shirt can be worn underneath the uniform shirt when the weather is cold, and during hot weather, your boy will thank you for the short sleeves. Also, buy the shirt one size too big. This way you will be buying less uniform shirts over the span your Cub Scout years. Cap--Official navy-blue cap with orange front panel and tiger cub emblem for Tiger Cubs, yellow panel and wolf emblem for Wolf Cub Scouts, blue panel and bear emblem for Bear Cub Scouts. Webelos Scouts wear an olive cap with a plain panel bearing the Webelos logo. Neckerchief —Triangular neckerchief is orange with navy-blue trim for Tiger Cubs, gold with navy-blue trim for Wolf Cub Scouts, light blue with navy-blue trim for Bear Cub Scouts, and plaid for Webelos Scouts. Official BSA neckerchiefs are the only neckerchiefs boys should wear. Neckerchief slide--Official gold-tone metal slide with the Tiger Cub, Cub Scout, or Webelos logo. Boys may wear handmade neckerchief slides. Handbook—Scouts should obtain the handbook for their rank. Boys can wear jeans or shorts that are clean and neat with their uniforms. Class "B" T-Shirt ($7 from the Pack)—for active meetings and some outdoor activities. Shirt-- with Pack 3334 Insignia (see below)—Webelos Scouts may choose to wear either the blue Webelos uniform based on the Cub Scout uniform or the tan/olive uniform similar to the one Boy Scouts wear. 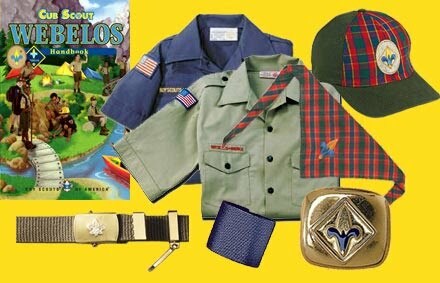 For the tan/olive uniform, boys wear the official Boy Scout tan long- or short-sleeved shirt with blue shoulder loops. Cap—Webelos Scouts wear an olive cap with a plain panel bearing the Webelos logo. Belt—Official navy-blue or olive web belt with metal buckle and Webelos Scout emblem. Note that the Webelos belt buckle will fit either the blue or the olive belt, but the belt loop recognitions for the Cub Scout Academics and Sports program fit only on the blue web belt. Neckerchief slide--Webelos neckerchief slide (handmade slides are also acceptable), Webelos cap, and Webelos belt buckle. Handbook--Scouts should obtain the handbook for their rank. Trousers or shorts For the tan/olive uniform, boys wear the official Boy Scout olive trousers or shorts. Socks Official blue socks (with gold tops) are worn with the blue uniform, and official olive socks (with red tops) are worn with the tan/olive uniform. 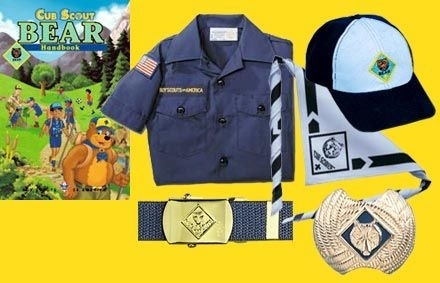 When a boy first joins Cub Scouting, his uniform will display only those badges that identify his status. The World Crest emblem is worn by all youth and adult leaders. The 1-1/2" diameter badge is white on a violet background. It contains a basic fleur motif encircled by a rope tied with a reef or square knot symbolizing the unity and brotherhood of the World Organization of Scouting Movement (WOSM) throughout the world. The emblem should be, worn centered horizontally above the left pocket, and placed vertically between the left shoulder seam and the top of the pocket. Worn by all Cub Scouts directly below the shoulder seam on the left sleeve. This emblem is unique to our BSA council. A white numeral embroidered on red background. Worn by all boys and pack leaders directly below the council patch on the left sleeve. A gold numeral embroidered on navy blue background. Worn by Cub Scouts and Webelos Scouts centered and touching the bottom of the U.S. flag on the right sleeve. 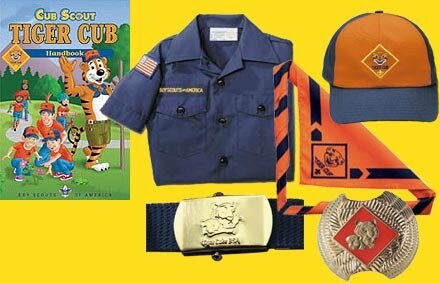 As he progresses, the Cub Scout will earn badges, pins, medals, and other insignia that tell of his accomplishments in Scouting. These items should be added to the uniform only after they have been earned. 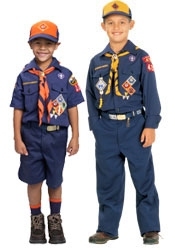 In general, every Cub Scout should wear his uniform to all Cub Scouting activities, including den and pack meetings, unit outings, and any activities done with members of the den or pack. When playing sports, going to camp, or participating in other physical activities, Cub Scouts can wear a Class "B" t-shirt available from the Pack or at the Scout Store. Pack leaders will provide advance notice of any occasion when the boys should wear anything other than the complete uniform. DO NOT mix uniform parts with non-uniform clothing, such as wearing a uniform cap with other clothing. 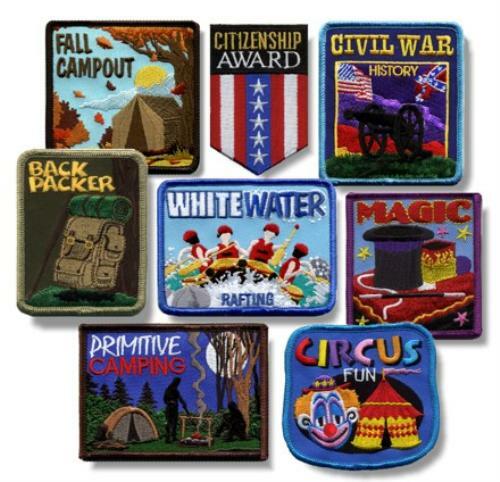 All about Cub Scout fun patches and uniform patches. What is a fun patch or temporary patch? What patches are actually sewn onto the uniform.